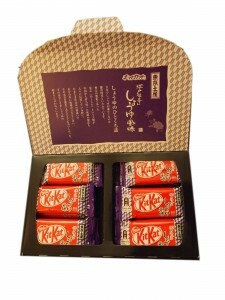 Review: Syoyu-Fumi Kit Kat (Soy Sauce Flavour) | Oyatsu Break! So I’m going to go out on a limb here and say that the romanized version of the name has an error in it. 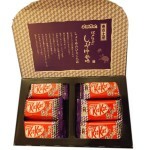 In Japan, Soy Sauce is typically called shoyu, but this Kit Kat is called “syoyu”. It wouldn’t be the first time that the romanization went wrong, and really, considering what a guessing game figuring out some of the flavours in the first place can be, I will be greatful that there was romanji on the package at all. So! 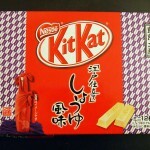 Soy Sauce Kit Kat! 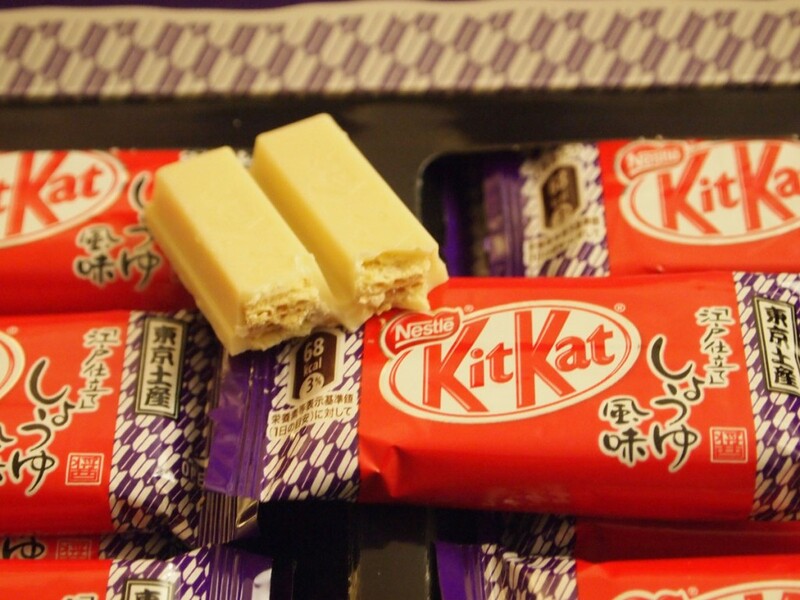 This one is in the upper-echelon, the top-3 of weird Kit Kats that folks outside of Japan have heard of and need to try, or need not to (the other two are Cheese and Wasabi, fyi). 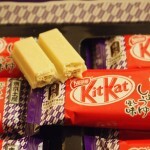 I was totally thrilled to finally get a chance to try these Kit Kats, and I made sure to share some of the (many) packages I brought with friends, family, and co-workers, just because it’s such a unique–and potentially shocking–idea. 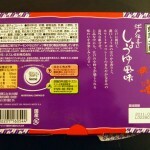 Packaging: Much like the recently-reviewed Sweet Potato Kit Kat, Soy Sauce comes in limited edition gift box packaging and is considered to be a Kyoto specialty. Because of this and the use of a traditional Japanese ingredient and the obviously adult audience for it, the box is just a gorgeous piece of design, dressed to the nines in traditional Japanese patterns, and with simple and elegant styling. I tend to love all of the gift boxes, but this one really is gorgeous and something special, as are the interior chocolates wrapped inside. Scent: Now, here’s the thing. Just cracking the package immediately fills the air with a strong scent–but if you’re thinking that you’re going to get a huge whiff of soy sauce think again. It’s sweet. Really sweet. Bringing it in and just inhaling it for a while, the scent will eventually, inevitably hit you: maple syrup. It smells exactly, and strongly, like maple syrup. Really sweet, a touch artificial, and strong. It’s really weird. Taste: And then you taste a little bite of it, and…? MAPLE SYRUP. If you’d given me this Kit Kat and told me that it was maple syrup flavour, I’d call it a triumph and one of the most accurate Kit Kat flavours to date. But… soy sauce? I couldn’t really taste any no matter how many little bites I had. Then I tried something different. I popped the whole bar–two fingers–into my mouth at once and started chewing. At the outset the maple was still there, but after chewing for a second or two the saltiness of the bar really, really came through. I still wouldn’t call it soy sauce, but it was much saltier and closer to the idea of a salty soy sauce candy bar. A quick dissection of the bar confirms that all of the sweetness–and some additional flavouring–are in the white chocolate coating. Opening up the bar and just tasting the creme in the middle gives you an almost unpleasantly salty taste. The saltiness of the shoyu is all in the wafers and creme, and when you’re just taking a bite off the end, the ratio is messed up because of how much white chocolate covers the end of the finger. Eating it all at once balances out the flavour, and makes it really interesting, and unique. I still don’t get that ‘oomph’ of umami that I get from soy sauce, but it’s much closer in flavour and tone to its intentions, and that’s neat. Verdict: All of that said, it’s a pretty great flavour. I like maple, I like salted candies, and this all works well together. While I strongly recommend not licking the inside of the wafer (it’s like if you did that to an oreo, except the oreo creme was just a salt-lick), consumed all at once it’s really neat, and unique. 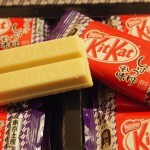 It’s funny, everyone eats this bar the same way, tentatively taking a little bite off of the end, going “oh, that’s not what I expected”, and then being mildly disappointed that it’s just another Kit Kat with a faint maple taste. This one is worth looking at again if you’ve tried it before, and maybe Nestle should look into balancing the flavours a little more too. “syo” is just an alternate way of writing “sho”. 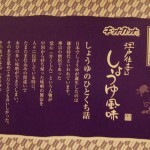 “syo” is the Nihon-Shiki or Kunrei-shiki romanization, and “sho” is the Hepburn romanization. Actually, 「しょ」is often romanized as “syo”, so it really is not incorrect. Love the site, just wanted to clear that up as it’s not a mistake! Thanks for letting me know! Romanization is still something I’m learning, so this is really helpful!